I have withdrawn the offer of money for articles for two reasons; Firstly no-one has really taken it up, and secondly I am spending my money on a new web venture. It's a web 1.0 venture even! I'll post a link to it on my front page when it goes live. In the meantime if you want to post to the BA Handbook I would be very appreciative, but I think it needs a champion to chase people and make things happen. Any volunteers? $50 paid for article contributions to the Business Analysts Handbook. 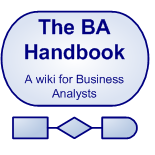 I am the initiator of the Business Analysts Handbook on wikia. The site is designed to be a repository of techniques, processes and information resources for business analysts. I started the site because I often work as a business analyst and with business analysts. Many want more knowledge about their role but don't know where to turn. 2006 was a turning point as many training services, books and organizations arrived with these resources. This Wiki is another part of that mix of services. My problem (that is; my thing) is that I am passionate about sharing knowledge and this is an area in which I have some. And I feel like I need to facilitate it beyond my time limited efforts allow. I am offering AU$50 per month for the best article on something (anything!) to do with business analysts or analysis that is contributed to the Business Analyst Handbook until further notice. Here is the link: http://businessanalyst.wikia.com. Your article should be subject to one of the creative commons licenses, but at he very least it's mine to reproduce (with credit to the author) wherever I want. All the best with the growth of the site. I did submitted a comment on project management skills. Good luck with the venture. Great job. There's definately some good information here. I posted an article about the characteristics of quality requirements. Hope it helps to grow the site.